Virat Kohli is an Indian Cricketer and current captain of Indian Cricket team. He became captain in January 2017, when former captain Mahendra Singh Dhoni stepped down as captain. Virat is considered one of the best cricketers in the world. In 2013, he scored the fastest ODI century by any Indian cricketer, surpassing Virendra Sehwag. Virat was part of the Indian Team when they Won World Cup in 2011. He was Awarded the ICC player of the Year title in 2012, the same year he was appointed the Vice-Captain ODI team. He was given the prestigious Sports Award 'Arjuna' in the Year 2013, for his achievements in the field of Cricket. His autobiography 'Driven: The Virat Kohli Story' was released in October 2016. Virat Kohli was Born in New Delhi, on 05 November 1988. Virat's father Prem Kohli was a lawyer and his mother Saroj is a housewife. He is the youngest of Prem Kohli's 3 children. He started playing cricket at an early age and joined the West Delhi Cricket Academy. His talents were unmatched and quickly caught coaches' Attention. Virat Kohli first played for Delhi under-15 and Delhi under 17 team between 2002 and 2004. His first international tour came in 2006, when he was selected for England tour by under-19. During the ODI series, he scored an average of 105 runs and 49 in the Test series. In 2006, while playing for Delhi, he debuted into first class cricket, against Tamil Nadu. In April 2007, during the Inter-State T20 Championship, he debuted into the Twenty20 format and scored an average of 35 runs in the series. His big break came in February 2008, during the 2008 ICC Under-19 Cricket World Cup, when he played the captain of the Indian team. India under-19, went on to win the world-cup. He played well during the qualifying rounds and was named 'Man of the Match' for two matches, one against England and another against New Zealand. His captaincy was applauded at the finals against South Africa. During India's 2008 tour of Sri Lanka, its top-order batsman Sachin Tendulkar and Virendra Sehwag were injured, Virat Kohli was included in the team and opened the matches for every match. For the first 3 matches he scored decently and in the fourth match he scored a half-century and helped India win the series by 3-2. Post 2008, Virat Kohli was part of India A team and was in out and out of team frequently. In 2009, in a tri-series with Sri Lanka, when Gautam Gambhir was injured and not fit to play, Virat was again included in the national team. Then again during the 2009 ICC Champions Trophy, Kohli replaced injured Yuvraj Singh. He scored an unbeaten 79 against West Indies and was named Man of the Match. Virat Kohli scored his first ODI century, against Sri Lanka in December 2009. In early 2010, when Sachin Tendulkar was not fit to play, Virat Kohli was let in the team again, for the Bangladesh series. India was chasing the huge score of 297 and was not doing well, when 3 of its batmen retired for 51 runs. 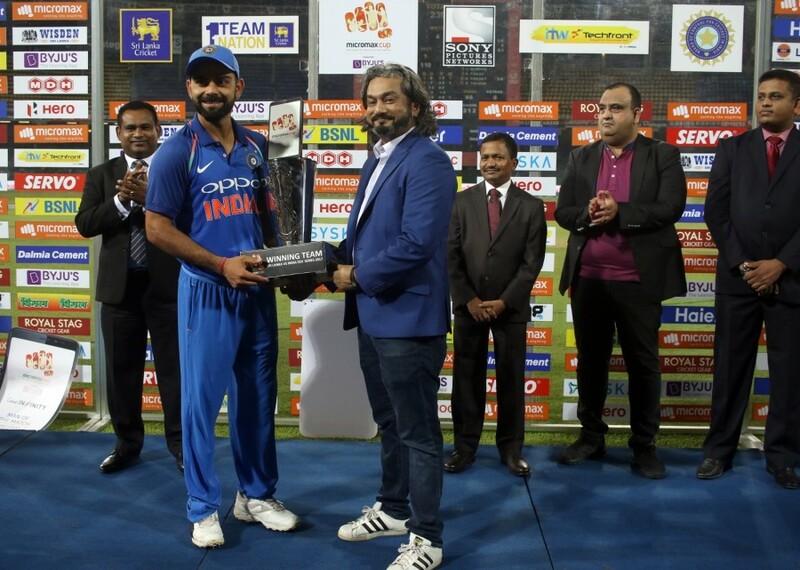 Kohli scored 91 runs and helped India secure a win. In the next match of the tri-nation tournament, he scored an unbeaten 71 against Sri Lanka. In the next match against Bangladesh, he scored his second ODI century. In May-June 2010 , Virat Kohli was appointed Vice-Captain for the tri-nation series against Sri Lanka and Zimbabwe. Kohli made an average of 42 runs during the series. He completed his 1000 ODI runs, during the series and became the fastest Indian player to do so. In January 2011, Virat Kohli was listed number 2 on the ICC Rankings, during the South-African tour. Virat was selected in the 15-member squad of Indian World cup team, in 2011. He played well at the World Cup, his partnership with Gautam Gambhir proved to be very useful, in the final against Sri Lanka. Virat Kohli played in the international Test format of Cricket during the West Indies tour of June 2011. He did not do well in the series and was initially dropped out of the next series against England, but was called in later to replace injured Yuvraj Singh. In November, he was again selected for a Test series against West Indies. Virat Kohli scored 107 runs against Australia, In February 2013. India won the series by 4-0 and Kohli with his good performance fixed his place in the test team. Virat Kohli was signed by Royal Challengers Bangalore for 2008 season of Indian Premier League. He was appointed the captain for 2013 season. He scored the most runs, by a player in a season, in 2016. He scored a total of four centuries, he also completed 4000 runs mark while playing at IPL. Virat Kohli was appointed the captain for the first time, against Australia, in December 2014. He also scored a century in the first match of the series. When MS Dhoni announced his retirement from Test Cricket, Kohli was put in charge of the captaincy. Virat has been the captain of Test format since then. Virat scored a total of 692 runs in the series. In the 2016 series against West Indies, Virat Kohli scored 200 runs, which was his first double century. After MS Dhoni decided to leave playing captain for the Indian team, Virat Kohli was appointed the Captain for limited-over formats of Cricket, in January 2017. Virat is deemed to be one of the best captains of Indian Cricket team. ➯ Virat Kohli scored the fastest 8,000 runs in ODIs. ➯ Virat Kohli scored fastest 15,000 international runs. ➯ Fastest century by an Indian cricketer in ODIs (in 52 balls). ➯ Most ODI runs in 2010-16 by an Indian cricketer. ➯ Fastest and the first ever batsman to score double centuries in four consecutive series in Tests, against West Indies(200), New Zealand (211), England (235) and Bangladesh (204). ➯ Fastest in the world to reach 1,000 runs in T20Is. 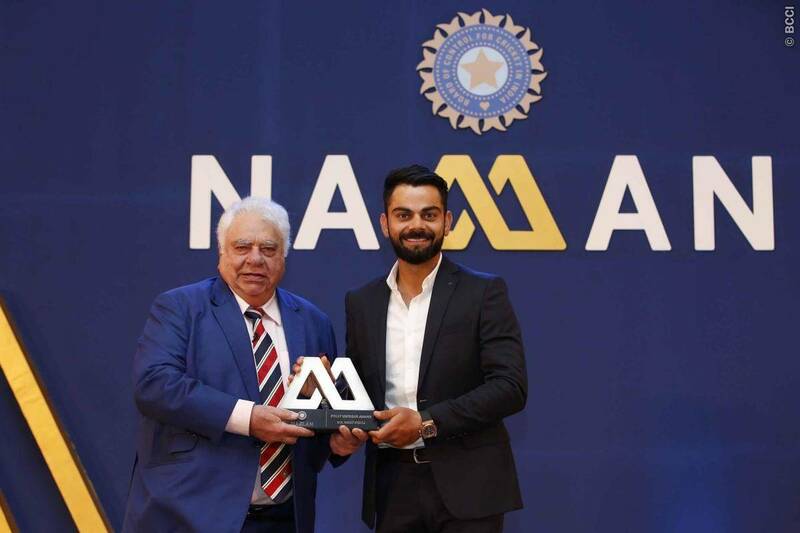 ➯ Virat Kohli was given Arjun award in 2013. ➯ Virat Kohli is an Indian Cricketer and current captain of Indian Cricket team. ➯ Virat Kohli was born to lawyer father Prem Kohli. ➯ Virat Kohli used to play for Delhi team before debuting into International cricket. ➯ Virat Kohli debuted into ODI against Sri Lanka in 2008. ➯ Virat Kohli scored his first ODI century, against Sri Lanka in December 2009. ➯ Virat Kohli was appointed Vice-Captain for the tri-nation series against Sri Lanka and Zimbabwe, in May-June 2010. ➯ Virat Kohli was appointed the test captain for the first time, against Australia, in December 2014. ➯ Virat Kohli was appointed the ODI captain in January 2017. ➯ Virat Kohli was signed by Royal Challengers Bangalore for 2008 season of Indian Premier League. ➯ Virat Kohli's autobiography 'Driven: The Virat Kohli Story' was released in October 2016.